Who wants to watch me take off Snivelly's trousers? (SPOILERS) The beginning of the homogenisation of Harry Potter, assuming you didn’t think he was a wholly homogenised product to begin with. 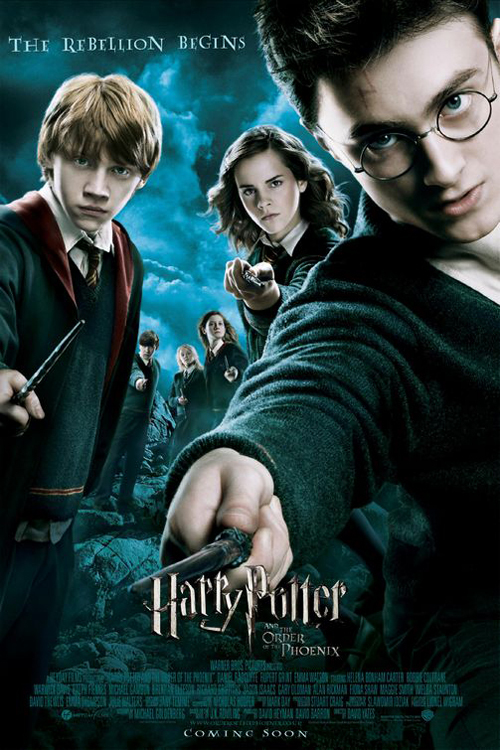 And by that, I’m not necessarily levelling a charge –Harry Potter and the Order of the Phoenix is qualitatively second only to Prisoner of Azkaban at this point in the running – but rather pointing out that David Yates has been the appointed ship’s captain ever since, even into the new prequel quintilogy. It means you’re going to get a reliably similar result, fine if you adore what’s on offer, so if you’re looking for a different take, spin or insight into the source material, your luck’s out. My biggest criticism of Yates is probably an obvious and oft-levelled one; that he enforces on the series a rather drab, monotone digital colour grading in post, lending each scene an undifferentiated wash effect, except in as much as the wash may be green, or brown or blue (often green). Some may consider the results atmospheric, but I tend to see them as rather bland, the sort of thing you witnessed with the Underworld series and hoped it stayed there. This clearly isn’t down to the cinematographer, as Yates only used Slawomir Idziak on this movie and would work with someone different for each of his subsequent excursions (counting Deathly Hallows as one movie). 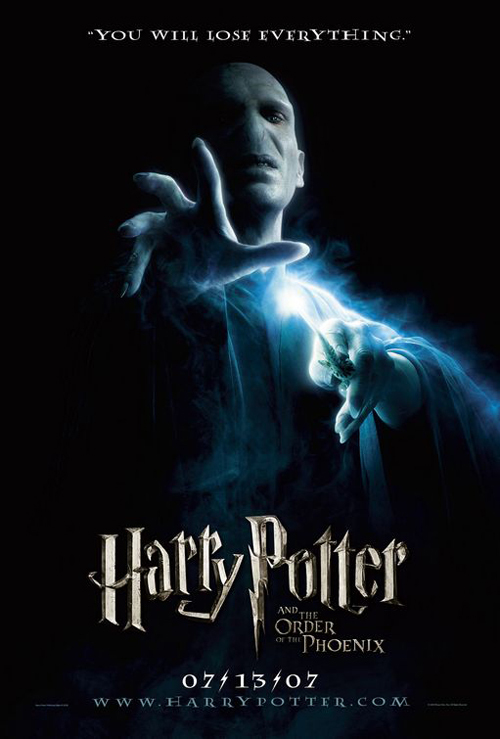 If you can get past that, and the effect is cumulative, rather than instantaneous with Order of the Phoenix, Yates brings to the series a tonal confidence and visual acuity that reaps dividends, albeit David Heyman might have overstated the value of his eye for the political, honed via TV, focussing on material that is earnest in its intentions but no less crude for all that in its content (one can forgive Emma Watson for interpreting Order of the Phoenix’s message in light of the 7/7/05 attacks, as she was young and doubtless prone to such seizures, although her comment “Facing the fact that authority is corrupted means having a non-conformist approach to reality and power” is curious within that context). The political dimension is a lesson on the dangers of groupthink and – an evergreen to those who believe it miraculously materialised in the Trump era – fake news, as the real danger approaching fast in the rear-view mirror is obnoxiously disdained and denied by the Ministry of Magic (a continually marvellous Robert Hardy; his performance has been one of the resounding pleasures of revisiting these movies, and it’s only a shame that Fudge’s admission of error and banishment from the series at the end of this chapter is both perfunctory and permanent), to the extent that a new totalitarian impulse is enforced over Hogwarts at the imposition of new Defence Against the Dark Arts professor Dolores Umbridge (Imelda Staunton), getting her hooks in and supplanting Dumbledore. Honestly, Voldemort may be a vision of evil, but Umbridge, thanks to Staunton’s Mary Whitehouse-by-way-of-Joseph Stalin prim-and-proper nightmare performance, is possibly the most sublimely disturbing creation in the Potter-verse. She isn’t a subtle character, and there are still frankly unlikely crowd-pleaser moments – her running screaming from the Weasely twins’ phantom snake – but Staunton breathes twitchy, prissy, sadistic life into Umbridge, and that her means of detention torture (“I must not tell lies” lines tattooed onto the detainee’s hand) leads to her own comeuppance (Harry parrots the instruction back at her when she asks him to explain to a mob of centaurs that she means no harm) is satisfyingly neat. Michael Goldenberg (Contact, the 2003 Peter Pan, one of those chewed up by Green Lantern) was responsible for cutting down longest book in the series, and I can’t say I noticed anything that felt short-changed this time. Indeed, there are areas where there might have been further pruning (despite the running time being relatively spruce). The picture starts off incredibly well, a hot oppressive afternoon turning nightmarish as Harry is confronted by Dementors (disturbing, but not quite as well envisaged as in Prisoner of Azkaban; you notice this in other aspects too, such as Sirius in the fire being a basic superimposition, rather than Order of the Phoenix’s CGI coals, or revisiting the series’ surprising capacity for crappy CGI, with Hagrid’s half-brother Grawp, who would have looked at home in the first movie) and saving his blinged-up cousin from death, leading to his trial for magicking in the presence of muggles. Subsequent elements of mystery – why is Dumbeldore shunning his pupil – are well-sustained, but others that are apparently significant but turn out to be disposable. The bottled prophecy is the very definition of a McGuffin (the reasons for attaining it are sketchy, its value nebulous, and it ultimately amounts to nothing). Meanwhile, as indebtedness to Star Wars goes, the vision of torture that entraps Harry is about as The Empire Strikes Back as it gets. And, of course, there’s too little Sirius Black. In a way, like Prisoner of Azkaban, this is a good thing, showing that Rowling (or the adaptors) recognises the power of a mythical hero as much as they understand the need to pull someone down who assumes such status. Like Boba Fett, Black is cooler the less you see of him, and killed off rather ignominiously before you can see more of him. Besides Staunton, two new additions to the cast deserve particular comment. Helena Bonham-Carter summons her goth-trash psycho from Fight Club as Belllatrix Lestrange, a complete fruit loop and slayer of Sirius (another Star Wars nod, as Voldemort is willing to sacrifice her, a devoted minion, in order to ensnare the services of a bigger fish). Evanna Lynch also makes an impression as “Loony” Luna Lovegood, delivering in grandly dippy fashion, with something of a junior Carol Kane air. Which leads me to the leads. At this point, I think Watson may have peaked with Prisoner of Azkaban, although her scenes of banter with Grint are always highlights – “I’m sure his kissing is more than satisfactory” she recriminates regarding Harry’s fumbling foray – while Radcliffe shows himself a merely sufficient lead. There’s never a sense he doesn’t need to be supported by the material, even if it would be unfair to suggest he provides other than dedicated competence throughout. His deficiencies are particularly pronounced in the picture’s least successful – and seemingly endless – episode, where he’s called to teach magic – after Umbridge has sanctioned only its theoretical use – to his fellow pupils and the picture begins to sway listlessly on the spot, unable to sustain itself without someone in command of the situation (even playing someone who isn’t in command of the situation). Contrast that with his scenes opposite Rickman’s Snape, training Potter to protect himself from Voldemort’s influence, and it’s illustration of how a more experienced performer can elevate his junior’s game. Radcliffe is likewise okay with Harry’s “What if I’m becoming bad?” subplot, which only really feels like lip service (to Luke Skywalker), and consequently there’s no chance we’re going to see it as feasible; indeed, the most effective moment comes via his CG-enhanced, possessed visage as Voldemort’s voice takes over. Perhaps the best, most upturning scene in the movies results from the Snape sessions, as the revered parent is brought crashing down to earth when Harry gains an insight into the bullying Snape received from his beloved departed father. (“Your father was a swine!”) And, unlike other instalments, where a question is left hanging that creates confusion, here I felt the lack of clarity over whether Snape, having been trusted with vital information by Harry (“He’s got Padfoot in the place that is hidden”), actually did anything with it (the novel makes it clear Snape contacted Sirius), was a means to intentionally seed doubts that would become important in the following movie. Sirius Black: A war? It feels like it did before. Nevertheless, the fight is far and away superior to the CGI ones in the Star Wars prequels (their closest comparisons), while the one between Dumbeldore and Voldemort bears similarities to both The Lord of the Rings and Big Trouble in Little China, of all movies (the conjuring of avatars). Again, though, following Goblet of Fire, there’s a slight sense of also-ran with the climax appearances by He Who Must Not be Named; they needed to go that extra step beyond the moustache-twirling villain who lives to fight another day, and never quite get there.